This entry was posted in Media, Technology and tagged betaworks, mobile apps, News.me by Erick Schonfeld. Bookmark the permalink. Very cool! I am a big user of the daily email news.me sends out. Will definitely check out this app. Upload error\’ and no clue whatsoever. There shloud be more info imho. When it works it works fine although having to delete the line enter tweet\’ is a bit annoying. I\’d like to see an empty tweet here or the ability to use a template\’ with i.e. time, date, location. 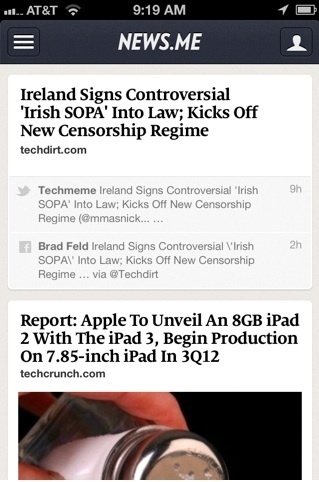 I think what News.me is doing is interesting. I definitely connect to publications in my social networks (Twitter more so, Facebook to some extent), so having extraction and curation services on the data that’s generated is pretty useful. At Jildy, we’re taking a different cut at the mobile / social / curation angle. We’re starting with the premise that many people have a deeply held Fear Of Missing Out (FOMO). So the mobile opportunity there is to provide a quick overview of who is talking to whom, and about what, in your various social networks. The goal here is to ensure that if something’s happening, you know about it. There’s a grand experiment afoot, in terms of all the various ways to approach the mobile consumption of social (or at least, socially curated) information. Interesting times! This looks like a pretty cool app will check it out. Cheers! I’d really love to be a part of group where I can get advice from other experienced people that share the same interest. If you have any recommendations, please let me know. Bless you! It is worth considering what “library” means. According to the OED, a lirbary is both a place and a collection. If one is using this definition, then there is a contradiction in the first sentence quoted above. As for the future of libraries, the history of libraries suggests that technological changes will broaden the resources and spaces (as well as services) that constitute, in particular instances, a “library.” For example, the primary way that lirbary users have accessed lirbary collections has changed over time—from the librarian to the printed catalog, from the printed catalog to the card catalog, from the card catalog to the online catalog—and it is changing now, from the online catalog to a collection of online discovery tools.Libraries can offer and save time for researchers, by facilitating better discovery and use of information resources. Libraries can also, in another sense, offer and save time for culture, by endeavoring to ensure the persistence of past and current resources for the future. You should also tell them about the various other positive results of video games for improving motor and mental skills. Nevertheless, they may be considered as Clash of Clans hile. they can while running from the desert. places while playing the action(s). There a wide range of advantages and downsides of playing free trucchi clash of clans. Nonetheless, to feel the genuine photo of the Mario browser game, you should feel it. women see in a guy like that.